Howick United F.C. coach William Potgieter was given a surprise when he visited the “Team of Choice” head office in Pietermaritzburg recently. 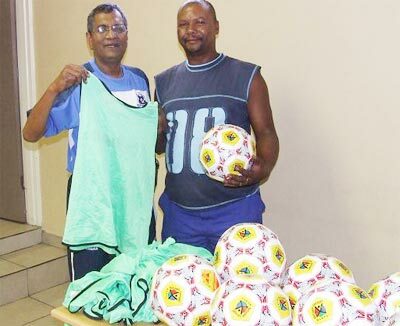 Maritzburg United donated training equipment in the form of training bibs and soccer balls to Howick United’s Potgieter. Potgieter the Uncle of Shaun Potgieter a mean footballer himself in his day was lost for words. He however took the opportunity to thank the Club for their generosity, and said “it seems that United read my Club’s needs”. He also thanked Fadlu Davids for initiating this kind gesture, has he had met Fadlu at the Liberty Mall and gave him a brief background of his team and their need for equipment. “I feel Fadlu spoke to the someone at the Club and hence this”, said a delighted Potgieter. Howick United are currently affiliated to the Pietermaritzburg and District Football Association Premier League and they also have an U14 team.